The Tech baseball team’s first series of the 2011 season against a ranked opponent was a successful one. The No. 21 Jackets hosted No. 23 St. John’s from February 25-27 at Russ Chandler Stadium and took two out of three games against the visiting Red Storm, getting strong pitching performances en route to winning the first two games 13-0 and 5-0 before dropping the finale 13-3. The Jackets faltered in a midweek contest against Georgia State, though, falling 6-3 in the in-state battle. The series against SJU marked a key early-season test for the Tech pitching staff as it faced a lineup that returned several dangerous hitters from a team that won the 2010 Big East Conference title. Among the returnees were the top two hitters from last season’s squad, left fielder Jeremy Baltz and shortstop Joe Panik. Baltz, the 2010 National Freshman Hitter of the Year, hit .396 with 24 homers, 85 RBI and a 1.251 OPS in his rookie season; Panik batted .374 with 10 homers and an on-base percentage of .477. Junior right-hander Mark Pope got the start against the SJU lineup on Friday night and proceeded to shut down the Red Storm hitters. After a rocky first inning, Pope settled in and began consistently throwing strikes, and none of the opposing hitters were able to make solid contact against him. The Tech hurler cruised through six scoreless innings, keeping the SJU lineup silent as he allowed just six hits and a walk while striking out seven. “Coming out of the first inning…I just needed to relax a little bit. My two-seam [fastball] wasn’t moving as much as I wanted early on, but after a while I settled in,” Pope said. “I thought over his last couple of innings, he threw the ball really well. He had a good fastball with a lot of sink on it today and a pretty good slider…and [the SJU hitters] didn’t get many good swings on him,” said Head Coach Danny Hall. In the meantime, Tech’s lineup had ensured that Pope had more than enough run support. After a relatively quiet opening week in terms of scoring, the Jackets erupted for 10 runs in the bottom of the first to quickly seize control of this game. Facing SJU left-hander Sean Hagan, freshman center fielder Kyle Wren and junior second baseman Jacob Esch led off with back-to-back singles. Junior first baseman Matt Skole started the scoring with a towering three-run homer to center field, his first of the season and the team’s third. “Skole’s home run really got us going. We were able to follow that with a lot of hits and get way ahead early, and we never looked back,” Hall said. Following two more singles, Hagan finally recorded an out but proceeded to allow three more hitters to reach base; in that span, freshman left fielder DeAndre Smelter recorded an RBI when he was hit by a pitch with the bases loaded, and freshman third baseman Chase Butler followed with an RBI single to give Tech a 5-0 lead. After a Wren sacrifice fly scored another run, Hagan allowed three straight singles again and was finally pulled from the game. His final line for the day was 10 earned runs allowed on nine hits and one walk as he threw 47 pitches in 0.2 innings. “[Hagan] just seemed a little flat today. I’m sure he’s a better pitcher than [he showed], but a lot of his pitches were flat and he left a lot of [pitches] up,” Hall said. “He was just leaving the ball over the plate, and his offspeed pitches weren’t the best…and we were swinging [well],” Skole said. The score was 9-0 when Hagan left, and Tech freshman first baseman Daniel Palka singled on the first pitch he saw from reliever Eddie Medina to drive in a 10th run. One batter later, the inning ended. In total, the Jackets notched 10 runs on 10 hits during the inning; all but one Tech hitter reached base in the opening frame, and four of them reached base twice. The Jackets added two more runs in the bottom of the second, taking advantage of poor control by the SJU pitchers to extend the lead to 12-0. Tech scored one more in the fifth inning, and neither side scored from then on. Three Tech relievers hurled a scoreless inning each in relief of Pope, and the Jackets won 13-0. Skole, freshman catcher Zane Evans and Palka had three hits apiece; Skole finished the day with four RBI, and both he and Evans scored two runs in the game. Perhaps the most interesting line for a Tech hitter, though, was that of Smelter: the freshman went 0-1 but reached base three times after being hit by a pitch twice and drawing a walk. The Jackets got another shutout the following day, and this time the highlight was indeed the pitching performance. Junior left-hander Jed Bradley pitched seven no-hit innings before being pulled from the game before the start of the eighth inning, and the Jackets went on to win 5-0. The game was a pitchers’ duel for some time, as the Jackets were only able to add two runs through six innings. Palka drove in a run on an infield single in the third and Tech pushed across another run in the fourth to take a 2-0 lead. Meanwhile, Bradley kept the SJU lineup completely silent. He allowed just three walks in seven innings as he struck out 10 Red Storm hitters. Through seven innings he had thrown 103 pitches, but he did not take the mound in the eighth inning. Freshman right-hander Dusty Isaacs replaced Bradley, but he was unable to preserve the ongoing no-hitter, quickly allowing a single to designated hitter Frankie Schwindel. Isaacs and Smelter did hold up the shutout, though, and Tech went on to win 5-0. Skole had another strong day at the plate, going four-for-four with a double in his first start at third base. Wren continued to produce in the leadoff spot as he had two hits, an RBI and a run scored. Sophomore right fielder Brandon Thomas had a two-run double in the seventh inning to pad Tech’s lead late in the contest. With the series clinched, Tech looked to complete the sweep in Sunday’s finale, but SJU had other plans. The Red Storm scored early and often, taking advantage of Tech sophomore right-hander Buck Farmer’s struggles to win the contest 13-3. In a bizarre top of the first, Farmer did not permit a hit and recorded three strikeouts but also allowed four walks. Two of the strikeouts came on 1-2 counts, while three of the walks were on 3-0 counts. The ultimate result was that SJU’s Baltz drew a two-out walk with the bases loaded, earning an RBI in the process and giving the Red Storm a 1-0 lead. The Jackets also loaded the bases with two outs in the bottom half but were unable to capitalize, as Smelter ended up grounding out to short, so SJU led 1-0 after one inning. After Farmer retired the side in order in the second, the Red Storm added to their lead in the third inning. After the leadoff man reached on an error, Panik hit a two-run home run to right, and second baseman Matt Wessinger added a two-run shot of his own later in the inning to give SJU a 5-0 lead. The Jackets did push across a run in the bottom half, courtesy of a Skole RBI single, to cut the deficit to 5-1. SJU continued to score, though, and ultimately they were able to break the game open. Farmer left the game in the fifth inning after allowing an RBI double, and the Red Storm proceeded to score at least one run in every inning from the fifth to the eighth, culminating with a four-run eighth that gave them a 13-1 lead. 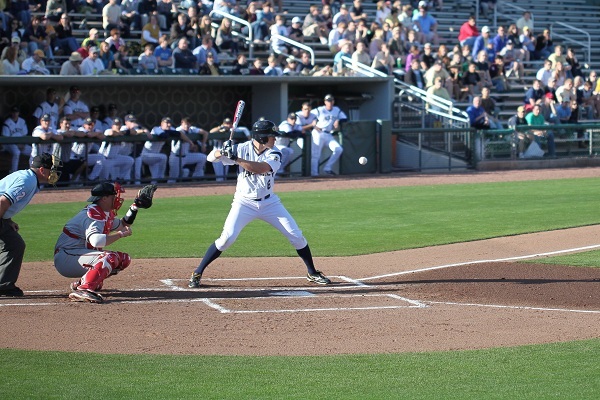 Tech added two runs in the bottom of the eighth and shortly afterward had the bases loaded with two outs, but the rally did not go anywhere, as junior pinch-hitter Jake Davies flied out to end the inning. The game ended with SJU winning 13-3. It was a rough afternoon for Tech’s pitching staff. Farmer allowed seven runs (four earned) on five hits and four walks in four-plus innings, though he did strike out six. Senior left-hander Taylor Wood went 1.2 innings and allowed a run on three hits, and freshman right-hander Jonathan Roberts pitched the eighth inning and allowed four runs on three hits and two walks—though all four runs were unearned. The only hitters who had decent days at the plate were Wren, who went two-for-two, and Skole, who was two-for-four with two RBI. The Jackets had one midweek game: a home contest against Georgia State on Wednesday. Freshman right-hander Matthew Grimes got the start for Tech. He quickly gave up a run, as GSU left fielder Mark Micowski homered to right-center on a full count to lead off the game, and he allowed a double to the next hitter. However, Grimes locked down after that and got three straight outs, and he struck out the side in the top of the second as well. Through two innings, the freshman had five strikeouts. GSU manufactured a run in the top of the third inning, but the Jackets did the same in the bottom half. Wren took first after being by a pitch and proceeded to steal second, and he scored on an RBI single by Thomas. An inning later, the Jackets added another run after a Smelter double set up an RBI groundout by Butler, and the game was tied at two runs apiece. The visiting Panthers added two more runs in the fifth inning to take a 4-2 lead, and they held the lead for the remainder of the contest. The Jackets were able to put two runners on base in three of the final four innings, but they only pushed across one run in that span. GSU added a pair of insurance runs in the final innings and pulled off the 6-3 upset. Grimes pitched five innings, and for the most part was never able to settle into a rhythm. The freshman ended up allowing four runs on eight hits and three walks; he did record nine strikeouts, but he left the game with the Jackets trailing 4-2. Another freshman, Isaacs, did a solid job in relief, holding GSU scoreless over the sixth and seventh innings while striking out three. There were few strong performances at the plate for Tech. Only two hitters, Thomas and freshman shortstop Mott Hyde, had two hits on the day, and the Jackets were often unable to force GSU starter Aidan Francis into mistakes. Francis allowed two runs on seven hits over seven innings, and over that span he did not allow a walk.